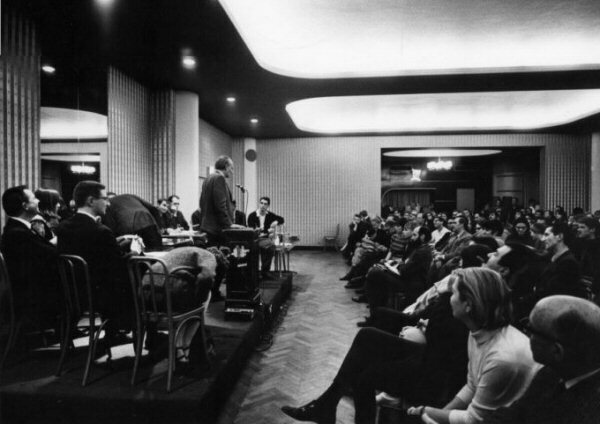 Billy Klüver at the first meeting of EAT in November 1966. Photo by Peter Moore © Barbara Moore/Licensed by VAGA, NY. This program, which was founded in 1966, enabled artists to carry out highly technological projects in close collaboration with a scientist or engineer. E.A.T. first enlisted specialists from different scientific fields who could meet the artists' technical needs. Among these specialists: engineers from Bell Laboratories (Murray Hills, New Jersey, U.S.) and IBM Labs (Armonk, New York, U.S.). E.A.T. paired the artists and engineers, who became joint members of the group. Yet E.A.T. didn't intervene in the project's design and development stages. To complement this partnership service, the group published a newsletter, E.A.T. News, that spotlighted ongoing and completed projects. As well, E.A.T. offered rental equipment and organized forums on such emerging technologies as holography, lasers and computer-generated imagery. In the late '70s and '80s, E.A.T paired engineers and artists, however, the Technical Service Program came to an end in 1973.